Own the Podium. Bad Name, Good Policy. I feel a little uncomfortable with Canada’s new swaggering, medal hungry, take-no-prisoners Olympic persona. 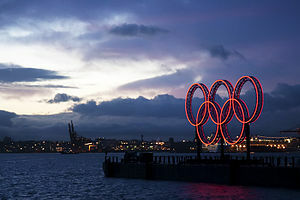 In 2005 the federal government launched Own the Podium – a funding strategy to dominate at the 2010 Winter Olympics and an ambitious goal to place first in the medal count. We weren’t just hoping or striving for the podium in Vancouver, we were going to own it. Canada, a country that normally prides itself on niceties, passive politics and weak coffee is suddenly talking smack and walking with a swagger. Except we’re about as intimidating as Kirsten Dunst in “Bring it On”. Our tough exterior is decidedly flimsy and the international community won’t hesitate in calling us out on it. Canada’s posturing strikes me as particularly distasteful given our role as host country. Claiming pre-emptive ownership over a podium that is earned by the efforts of individuals seems outrageously un-Canadian. I think I liked us better when we were considerate and unassuming. We Own the Podium… or we could share it. I’m sorry, did you want first place? We could switch spots. But despite its strange and imperious title, Own The Podium (OTP) sets an important precedent for innovative policy in Canada. OTP was a five year, $117 million initiative with two clearly articulated goals for the Olympics: win medals, fund athletes. Top Secret invested $8 million into 55 research projects which investigated everything from uniform design, a new compound base for snowboards, the fastest route down a ski hill, and the perfect technique for landing a quadruple axel. The rest of the OTP funding was distributed to Olympic teams and targeted athletes. For speed skater Kristina Groves OTP meant the difference between a foam roller (as a therapist) and a 20 member support team complete with a doctor, physiotherapist, and sports psychologist. Own the Podium created a cohesive policy network, organized around common interests that set clear objectives and took risks to strive for excellence. OTP has proven that talent and innovation can thrive in Canada with adequate support and clear vision. Why couldn’t this type of long-term, networked, goal-oriented policy making serve as a model for national and regional programs post-Olympics? From an international perspective, Canada will continue to compete for more than just medals and creative policy will be needed to address increasingly complex challenges. Imagine appropriating the OTP strategy to reduce carbon emissions, increase access to education or invest in health technologies. This is not to suggest that such complexities could be solved with a hundred million dollars and a pretty website, but rather that mobilizing stakeholders, setting ambitious targets and engaging citizens in public policy could position Canada as leader in international innovation. No smack talk or swagger necessary.